The ProSafe FS116P provides power and data from a single point, using Power over Ethernet (PoE) over a single Cat-5 cable. 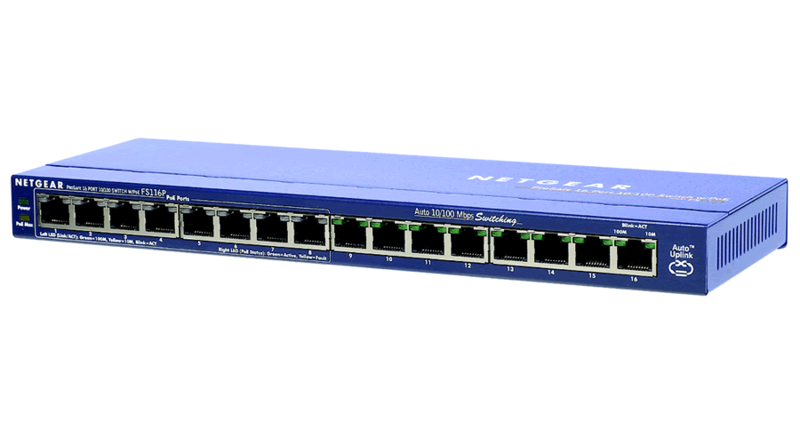 The sixteen Fast Ethernet ports can be used for any 10/100 Mbps link and eight of these ports can supply industry-standard IEEE 802.3af power. Advanced auto-sensing algorithm gives power only to 802.3af end devices, so no need to worry about damaging proprietary PoE or non-PoE equipment. In addition, it discontinues the power when PoE devices are disconnected. Easy and reliable, the ProSafe FS116P automatically determines PoE requirements, speed, duplex, and cable type using AutoUplink™. The affordably priced ProSafe FS116P delivers PoE to any small business network that wants to simplify the installation of wireless access points and IP-based surveillance cameras. These devices are optimally installed on a ceiling or high on a wall, away from most electrical outlets. PoE eliminates the requirement for a dedicated electrical outlet to power these devices. This allows for flexibility in situating devices where AC power is difficult to access and lowers installation costs. Compact and flexible, the ProSafe FS116P is ideal for small business network that want to inexpensively use PoE to deploy wireless access points and IP-based network surveillance cameras.